Just in from Commando HQ. 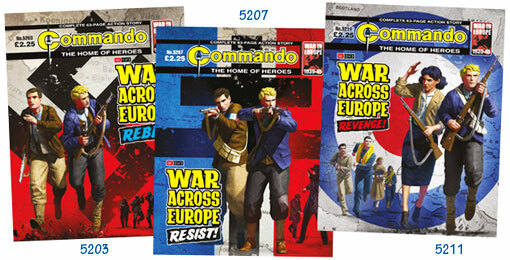 Commando is publishing three adventures (issues 5203, 5207 and 5211), written by Iain McLaughlin that are based on advents that his uncle went through in Europe during the war. Iain originally wrote a story for one issue but the editorial team thought it was such an interesting plot that they asked him to go back and expand it to three full issues. Iain only found out about his uncles war record after his death, as it surfaced at the funeral. “When (my uncle) died a few years ago, at his funeral we heard about his war service. For most of us, that was the first time we had heard the details of his war. These Commandos aren’t exact depictions of my uncle’s war but they are influenced by it and I hope they can be this nephew’s tribute to a much loved uncle and immensely brave man, as well as the men and women who fought alongside him”. To go with these issues, artist Neil Roberts has added his considerable talent to the cover art, which it has to be said is quite stunning. “Having the graphic shape of a symbol and maps in the design was, to me, a classic Commando element, I liked how it balanced the human nature of the story with the larger picture of their adventures, giving the images both context and a striking look”. Commando is still a great comic, no doubt about it. I decided very early on that the kitchen in my new man cave was going to be dedicated to the past, and so it is as I have put my classic old school magazine collection (basically stuff from the last full century!) in there for easy access. Yesterday, I added a new bar table (from Midori) in there, and the first of two bar stools (the second is incoming). 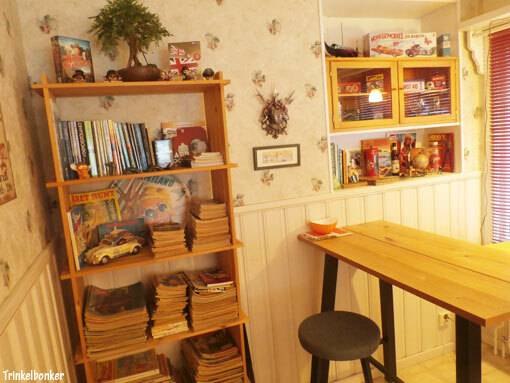 Just a nice little corner to grab a quick breakfast or a snack, and the option is that you have a nice reading table to check out that priceless (well, it is to me) collection. If I have people over for dinner, I will ask them to join me upstairs and serve it with the stunning mountain view I have here overlooking the water below my property. So I can afford to be a bit eccentric in the kitchen. To me, it just works and that is all I care about really. 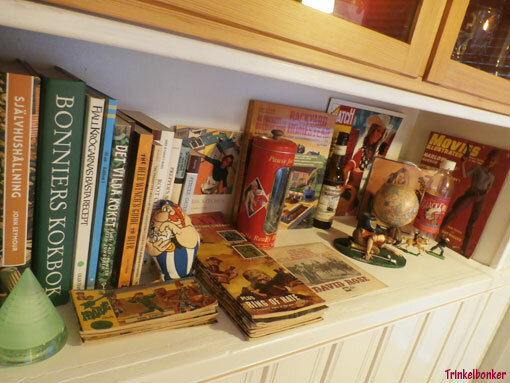 And yeah, I have some cookbooks in there as well, covering pretty much anything you can think of. 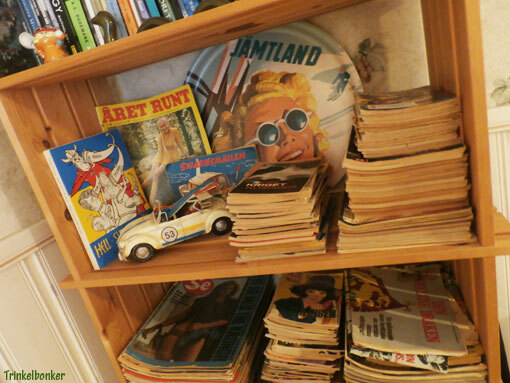 But the bottom line is, seeing old magazine covers with Agnetha Fältskog (of ABBA fame), Raquel Welch and Jane Fonda whenever you pop in there just adds to the overall quality of life. How could it not? Revell has put out a box that celebrates 125 Years of Hurtigruten, the Norwegian ship route that is highly appreciated because of the stunning scenery. The two boats, MS Trollfjord and MS Midnatsol has both been available before, but here they reappear together for the first time in this kit. 85 parts will do the trick, so it is not overly complicated. I would call this a good “father and son” box. The box includes glue and paint and as a bonus you get a poster of the excellent box art. I finally got around to see the Sci-Fi movie “Ghost In The Shell” and I was not disappointed. Scarlett Johansson is always good and she is quite memorable in this one. The future world looks great and the topic of A.I, robots etc is always going to be a good source for entertainment. Here is another man cave update. 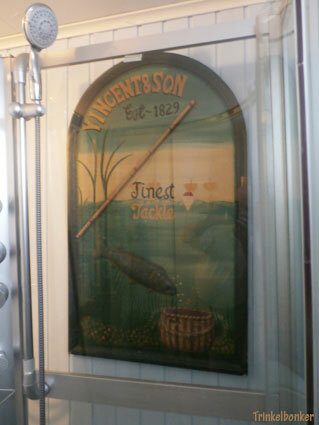 I located the perfect spot for this work of art in the downstairs laundry room, which also has this (extra) shower in it. Well, I do have a sauna down there as well come to think of it (although this functions as a magazine storage unit at the moment). It was a bit tricky to squeeze it in behind the glass and put it in place but I have to say that the end result looks rather nice. Having a ball coming up with ideas, but it has to be said that this project came as a bit of a surprise even to me. It is all in the little details. The first (self titled) Babymetal album was released in Japan on February 26 2014. Recorded over a period of over three years, it can almost be viewed as a compilation album of sorts, as this record consists of several songs that had seen previous release as (or on) singles in Japan. In fact, of the 13 tracks that you will find on this (classic) album, six has videos. At the time of release, Babymetal had two nights at Budokan lined up, which was a staggering statement in itself and the result of years of hard work. On February 25 2014, they added the sixth and final video (“Gimme Chocolate! !”) from this album on YouTube and it quickly became a viral success that soon catapulted them to international fame. It is currently closing in on 100,000,000 views and is likely to cross that magical mark within a few weeks. The album stormed the charts in Japan and sold over 37,000 copies in the first week alone. In December 2014 it was certified Gold in Japan for over 100,000 (physical) copies sold. Western media quickly went bonkers for Babymetal and they certainly made huge inroads on pretty much every market in the world in 2014. In July that year, the readers of UK publication Metal Hammer voted the debut Best Album Of The 21st Century. Official release followed in May-June 2015 in Europe (earMusic) and the US (Sony). Five years on, it sounds just as fresh as when it landed on, and pretty much assaulted (in a good way!) an unsuspecting rock community. Many sane people of all ages absolutely love Babymetal though, and I think it is fair to say that a legend was born with this album. Dynamite Entertainment in the US published the first issue of a new line of Xena comics over there in October. Titled “Penance”, this 124 page comic book in full colour sports a rather nice cover by David Finch. When this project was put in motion, they were probably hoping that the reboot of Xena on television would help, but as that was cancelled before they really got going it was not to be. Maybe there are enough old Xenites out there to support this project anyway?